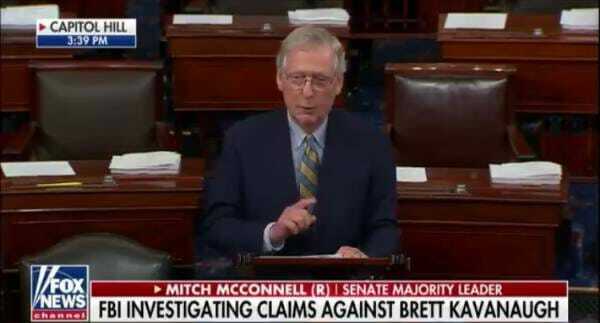 Senate Majority Leader Mitch McConnell (R-KY) delivered remarks on Judge Kavanaugh from the Senate floor Monday afternoon. Senator McConnell ripped into the Democrats for their ‘changing goalposts’ in regards to the Kavanaugh probe. The FBI is reportedly going to wrap up the supplemental probe into Kavanaugh by Tuesday–Kavanaugh has already undergone SIX FBI investigations–he is a vetted judge! Prospective timetable for Kavanaugh 1: DAY ONE: McConnell files cloture to end debate on the nomination. This step is necessary to break a filibuster. Prospective timetable for Kavanaugh 2: DAY TWO: By rule, a “cloture petition,” the parliamentary mechanism to end debate in the Senate, must lay over untouched for an entire day before it “ripens” and is ready for a procedural vote. DAY TWO serves as the layover day. Prospective timetable for Kavanaugh 3: DAY THREE: By rule, the cloture petition to halt debate “ripens” 1 hr after Senate meets. Requires 51 votes. If the Senate votes to “invoke cloture” or limit debate, opponents of the nomination then get 30 hrs to run out the string. Prospective timetable for Kavanaugh 4: Under “Nuclear Option II,” McConnell established a new “precedent” in the Senate to end filibusters on Supreme Court nominees last year. McConnell lowered the bar to break a filibuster on a Supreme court nominee from 60 to 51. Prospective timetable for Kavanuagh 5: DAY FOUR: The 30 hours of “post-cloture” time expires on the nomination. Opponents can no longer pull rabbits out of hats. The Senate takes a confirmation vote on the nominee. Confirmation requires a simple majority.